I’ve waited as long as I can. 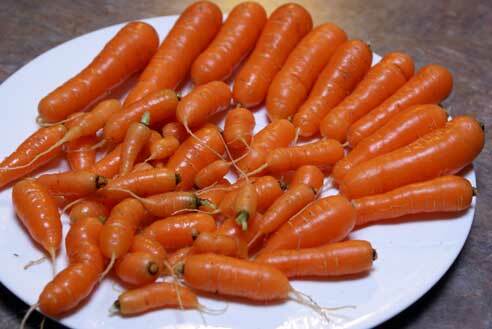 I just had to go and pull the carrots!!! Sweet, crisp and simply delicious! 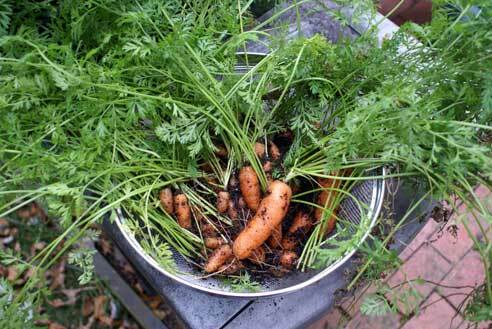 Tonight’s dinner is a simple beef roast with carrots from the garden, celery and some spices. I plan to strain and save the juices for beef stock. I bought a 2.4 lb. top round roast when it was on sale for $1.99/lb (reg. $3.99/lb) a few weeks ago. I let it thaw in the fridge and then added it to the slow cooker after breakfast. Easy as that! And since we can’t/won’t eat 2.4 lbs of beef in one meal, I plan to use half for this meal and the other half soon! Place beef roast into the slow cooker. Add carrots and chopped celery around the beef. Season with garlic salt and pepper. Wash and snap off ends of green beans. Steam in stovetop steamer or saucepan with 1/2 cup of water for 4-5 minutes. Bake (or microwave) potatoes and sweet potatoes. Vent with fork or cut slits with knife. Bake for 45-60 minutes, until soft. Cooking time will depend on thickness of potatoes. To microwave, vent in same way and cook for 5-7 minutes, or until soft all the way through. 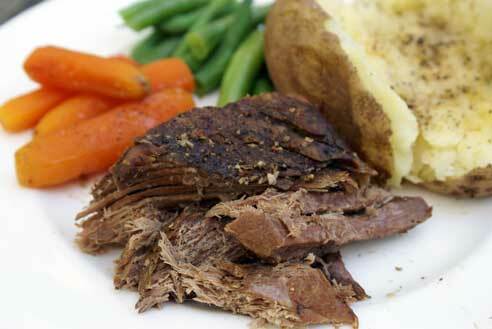 Serve sliced Beef Roast with Garden Carrots, Green Beans and Baked Potatoes. I just love your blog. I plan to use your menus to prepare a week’s worth of meals and post about it on my own blog very soon. Thanks so much! You maybe souped/stewed out, but a great way to use the leftovers is to make beef stew the following day. I just throw the leftover beef, carrots, celery and in my case potatoes into the crockpot with adequate broth along with a can of crushed or diced tomatoes and let simmer all day. Towards the end of cook time add a few handfuls of frozen peas or corn and heat through. Creating a second satisfying meal from the remaining roast beef, family loves its. I thought about doing that…and still might! We’ll see! I just have to say that your site Rocks! I absolutely love the fact you came up with meals that add up to be $5 most, amazing! This is so beneficial since I am now a SAHM/WAHM trying to really stay on a budget since we are a family of 5. I am currently using your recipe index to plan for next week, love the meal options! Thanks for sharing all of tips and tricks with us! Yes, the beef will add quite a bit to the water. I just strain the juices and maybe add 1-2 cups of water after its all cooked and then put it into the fridge. Let it cool, the skim off the fat layer (this is not necessary, but how I prefer to do it), then place the stock into a freezer baggies and freeze. Thaw when you need it for soup! Alergic to Potatoes – I never knew that was a possibility. We are having potato chees pierogies tonight, but infant son loves the filling. I have an award for you over at The JDaniel4’s Mom. Here’s a direct link: http://www.jdaniel4smom.com/2009/10/i-was-just-awarded-best-blog-award-from.html Hope you’ll stop by and pick it up. I do enjoy your blog. We’re a family of 5 of as well, but all my kids are heavy eaters. (they’re also a little older than your kids, *grin*). I would just toss the stew between pie crusts and call it pot pie!